Experience the great outdoors and participate in this fantastic winter sport! There are plenty of scenic spots to go cross-country skiing in Albany and the Capital Region. 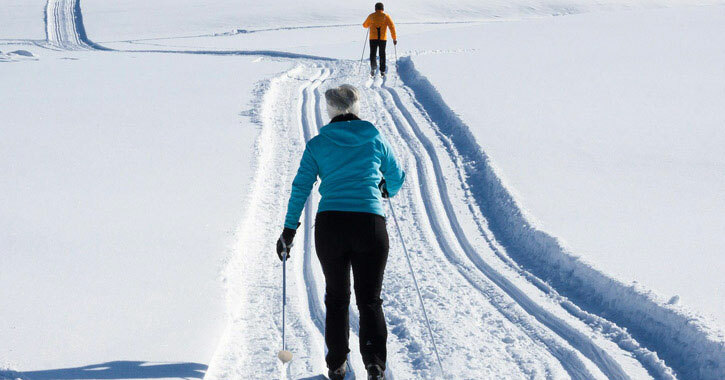 You can enjoy classic Nordic or faster skate-skiing at a nearby state park, ski center, or mountain resort. The Albany Pine Bush Preserve's many trails aren't just used for hiking and biking, but for cross-country skiing as well. There are about 20 miles of multiple-use trails that are marked and are considered easy to moderate. Named "Best in the Mid-Atlantic" and "Best Cross-Country Resort for Families," Lapland Lake Nordic Vacation Center includes 50 kilometers of scenic cross-country ski and snowshoe trails surrounded by a pristine Adirondack Forest Preserve. There is meticulous snow cat grooming for classic and skate-skiing, as well as a warming lodge, fully equipped rental and retail shop, PSIA Ski School, food service, illuminated trails, lessons including children's programs, ice-skating, junior tubing hills, ski rentals, snowshoes, tubes, pulk sleds, ice skates, Scandinavian kick sleds, and more! Lapland Lake has a season-long calendar of events and is an easy drive to the Southern Adirondacks. Enjoy 35 kilometers of groomed woodland cross-country skiing trails at Pineridge in Petersburg. Situated at the foothills of the Berkshires and Taconic Mountains and just a quick drive east from Albany, Pineridge offers wooded trails through hardwoods and evergreens. Go night skiing through four kilometers of lighted trails, or enjoy skiing through the track set specifically for traditional cross-country skiing. Prefer skate-skiing? Pineridge offers 20 kilometers of skating trails as well. Lessons, ski rentals, guided tours, a warming lodge, and a retail shop are all available. Delight in over 30 miles of groomed and track-set cross-country skiing trails in Hagaman set on a scenic Christmas tree farm! Just 45 minutes northwest of Albany, Tree Haven Trails offers trails for beginners and advanced skiers alike, making it a great place for the entire family to cross-country ski or snowshoe. A warming hut and ski rentals are also available. Head over to nearby Duanesburg for cross-country skiing in a flat to rolling woodland forest preserve. Schenectady County Nature and Historic Preserve is comprised of 102 acres of native hardwood and red pine forest for snowshoeing and cross-country skiing in winter.